Australia is packed full of incredible adrenaline fuelled adventures – from skydiving and white water rafting, to shark cage diving – it’s time to tick off some serious bucket list items! My personal favourite spot on the East Coast and somewhere I know most people will love as well, with its barefoot hippie vibes, incredible beaches and amazing surf. 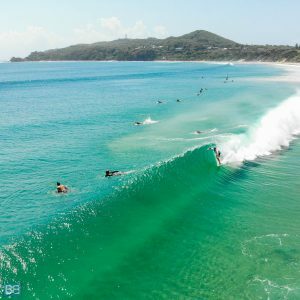 Make sure you pencil in some solid time here and check out my Ultimate Backpackers Guide to Byron Bay for details on where to stay, what to do, and how to get there. Sitting near the top of Queensland, Cairns is usually the spot people start or finish their East Coast adventure. I’ve written a whole post on the biggest mistakes people make when planning a trip to Australia, and distances is something people always mess up on! Australia is HUGE (you can fit the whole of Europe inside it!) so make sure you don’t underestimate travel times and distances! One of the most popular backpacker routes in the world, the Sydney to Cairns stretch of East Coast Australia is packed full of fun, sun, beaches, and good times. 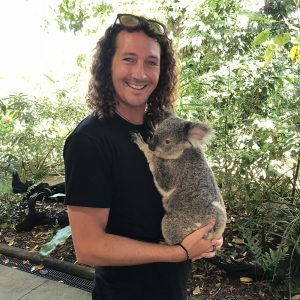 Make sure you download my ultimate guide to working and travelling in Australia for the full low down on where to go and what to do. If there’s one thing travellers love, its value for money, and nothing is better value than free! Every hostel and campsite in Australia has a free food shelf so make sure you check it out and grab some essentials. I’ve stocked up on everything from cooking oil to freshly ground coffee and even a box of port…don’t judge me, it was free! You haven’t travelled around Australia properly until you’ve had a night on goon. This cheap, boxed wine will get you where you want to go for a super budget price, but you’ll pay for it with crazy dreams and savage hangovers…before doing it all over again the next night! 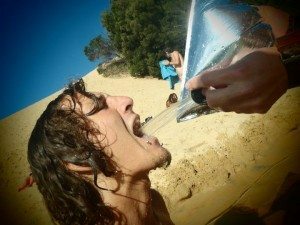 Australia has some incredible hostels, and hostel life is something that’s core to any travel experience. It’s the perfect way to meet new travel buddies, find out about the best nights out, and what there is to do up and down the coast. Although Australia doesn’t have the same connection to its indigenous cultures as the Kiwis do, the Aboriginal culture is something you should take the time to learn more about. From dreamtime stories to boomerangs and didgeridoos, it’s super interesting and something I feel Australia should celebrate a lot more. If you want the full outback Australia experience, why not try your hand at becoming a Jackaroo or Jillaroo? Basically the Aussie version of cowboys (and girls) you can spend a few days learning to horsehide, round up livestock, lasso stuff and generally live the outback dream! It’s also a great way to tick off your farm work if you’re hunting for the second year visa! Australia has some pretty unique and crazy wildlife – from cute fluffy koalas, to not so cute crocs and of course the iconic Kangaroo. Make sure you meet them all when you head down under! And if you’d rather eat them than meet them, you can also enjoy a kangaroo burger, crocodile burger or even Emu…! It’s also worth nothing that although the word c*nt is pretty offensive elsewhere in the world, in Oz is pretty endearing, so if someone calls you a mad c*nt it’s a good thing….but if someone calls you mate they could well be pretty annoyed with you! Another under rated spot on the East Coast, I loved my latest trip to Magnetic Island! It’s a really nice place to chill out pre/post Cairns chaos and hiring one of the ‘Barbie Cars” to explore all the beaches and look-out points is a must. Just a short ferry journey from Townsville, the easiest way to add it into your trip are the Magentic Island Package deals. For party people, hit up Base Magnetic Island (beachfront and with an epic bar), or for those wanting a more chilled spot, Bungalow Bay is nestled amongst the rainforest and you can even cuddle a koala! Both come with 2 or 3 nights accommodation, return ferry, and a welcome drink too. If you’re bouncing around Australia on the Greyhound Bus or Premier Bus, the chances are you’re going to have to endure an overnight bus journey at some point – usually Sydney to Cairns, or Rainbow Beach to Airlie Beach. So load up some movies on your laptop or phone, stock up on snacks and maybe one of those aeroplane neck pillow things! It’s All About The Big Blue! 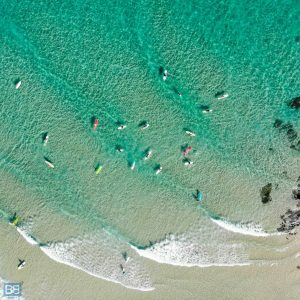 Life in Australia is all about the beaches and ocean, and the Aussies will take any excuse they can find to hit the big blue for fishing, surfing, swimming or just enjoying a few cold beers on the sand. 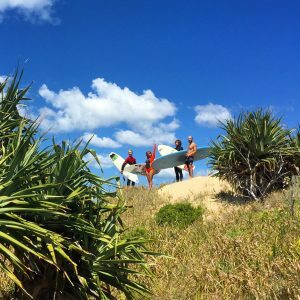 Learning to surf should definitely be part of your Australia trip too and there’s plenty of opportunity, with half day surf lessons, surf camps and even surf instructor training courses for those that want to turn the ocean into their office. By far the easiest ways to save on your trip to Australia is an Australia package deal. Combining your accommodation, tours and travel passes will nab you some serious discounts over booking everything individually – check out my East Coast Australia Planner for some awesome deals! Affectionally known as the happiest animal on the planet, these little dudes look like they’re always smiling! Get over to Rottnest Island (near Perth in Western Australia) for the best chance to meet them and snap a quokka selfie. 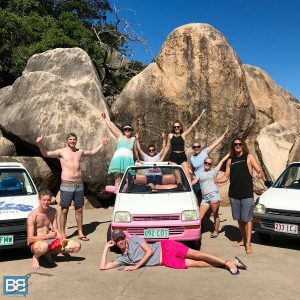 If you’ve ever wanted to live the van life, then Oz is an awesome place for an epic road trip with your buddies! 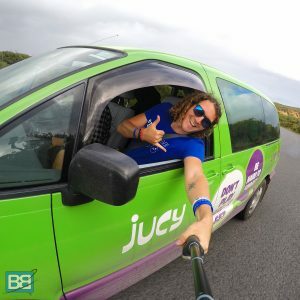 Campervan hire in Australia is super easy to sort and there are a variety of options to choose from – from budget campervan hire, to flash packer campers with full shower and toilet facilities! If you don’t want to go all out on a long road trip, then at least do the Great Ocean Road which can be done in a few days and is one of the best coastal drives in the world. Despite what some people think, Sydney isn’t actually the capital of Australia – it’s Canberra! Even so, Sydney is certainly the unofficial capital and the place most people end up flying into. With the iconic Sydney Opera House, the Harbour Bridge, and of course world famous Bondi Beach, it’s the place that will will give you that “wow I’m in Australia” moment. Who Wants To Meet Nemo!? 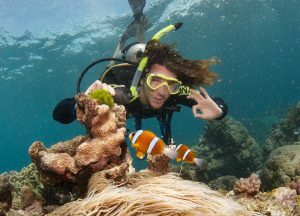 One of the top bucket list ticks for any trip to Australia, is The Great Barrier Reef. This incredible natural landmark can even be seen from space! Although it’s not quite as beautiful as it once was, it’s still worth checking out and the perfect place to try scuba diving for the first time. If you want to get away from the coast and explore the true Aussie outback, then a trip to Uluru and the Red Centre is a must. This beautiful spot is of special significance to Aboriginal culture and it’s the perfect place to discover more about their dreamtime stories and history. Although camping may not be everyone’s things, sleeping in a swag (a traditional Aussie single person tent) under a blanket of stars here is an epic experience – as is sunrise/sunset at the rock. As well as coming and going on tourist visas, Australia is also popular for their working holiday visas. These are available to a range of nationalities and are the perfect way to top up your travel funds, as well as spending a longer time exploring Oz. Check out my post on why Melbourne is one of the best places to start your working holiday visa, and join the crew of Welcome To Travel. These awesome dudes will help you combine sorting all the essentials with heaps of Aussie fun, and ongoing support. Also if you’re planning a year in Oz make sure you download my Ultimate Guide To Working & Travelling In Australia for heaps of useful tips, advice and info. Along with Fraser Island, a trip to the Whitsunday Islands is one of the big bucket list ticks for East Coast Australia – this network of islands at the south of the Great Barrier Reef are pretty spectacular. 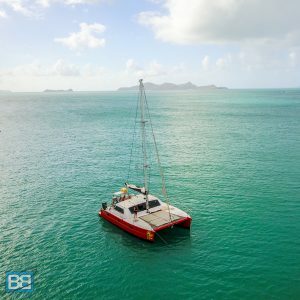 For those on a tight time frame, a scenic flight or day trip will quickly tick off the must see spots like Whitehaven Beach, but if you want the best experience, an overnight Whitsunday Sailing Adventure is a must. Picking the best Whitsunday tour can be a bit of a challenge though – with heaps of boats to pick, from party boats like the Atlantic Clipper, more mellow trips like Tongarra, or even luxury catamaran adventures like Powerplay…just to name a few! Anyone suffering from xenophobia (a fear of foreigners incase you didn’t know), should definitely avoid travelling in Australia. It’s an incredibly diverse country with people from all over the globe living there. In fact it has the biggest continuously running China Town outside of China (based in Melbourne), the biggest Greek community outside of Greece (again in Melbourne! ), and even the biggest Italian community outside of Italy…also in Melbourne! And on top of that, you’ll also meet travellers from all over the globe too! Just a few hours south of Byron Bay, Yamba is often overlooked by people travelling up the coast, and for me it’s the hidden gem of the East Coast. With empty beaches, heaps of wildlife (the golf courses is often frequented by mobs of wild kangaroos), and epic waves, it’s a great place to relax and enjoy a slower pace of life. Make sure you stay at Yamba YHA – run by Shane and Justin – who will make you feel like family in no time. Shane’s $10 tour is well worth checking out as well, showing you around the best of what this laid-back little town has to offer. I’m not a big fan of zoos…but what else could I really add in here for Z?! (Answers in the comments). The most famous is Australia Zoo (aka Steve Irwin Zoo), but honestly I was pretty disappointed with it. Out of the spots I’ve visited, I’d say Currumbin Wildlife Sanctuary on the Gold Coast was my favourite. Not only can you chill out with their friendly kangaroos and stroke a koala, but they also do heaps of amazing work for conservation and animal rescue. And there you have it – an A – Z of Australia! Can you think of anything better to add in? It was the great idea to list down the A-Z of Australia Travelling. I liked the concept and I liked the way you write about this. Nice work! I was wondering what you’d come up with for X and Z. I suppose there must be a good zipline somewhere around Australia too, if you need another Z besides zoos! hahaha zip lines would probably be a better shout actually, there’s an epic one in Cairns!